Julie Mueller – a seamstress, bibliophile, fishing enthusiast, loving dog rescuer, and wonderful mother of one daughter and one Corgi – recently underwent a stem cell transplant in February for stage III multiple myeloma. 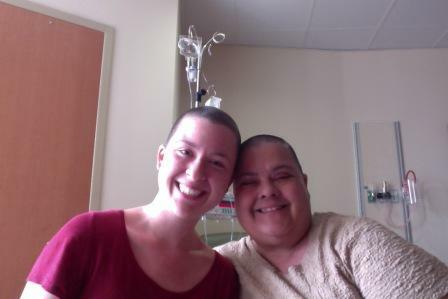 As an act of support, Julie’s daughter, Miranda, promised she would shave her hair when the time came. Eventually, Julie began losing her hair in handfuls, so they sent for the hairdresser. Julie shaved off about 6 inches of hair and Miranda shaved off 11 inches, all of which Miranda donated to Locks of Love, an organization that provides hairpieces to financially disadvantaged children suffering from long-term medical hair loss. For added encouragement as they were chopping their tresses off, Miranda turned to her friends in Paris – where she had been living for six months before moving back to the United States to be Julie’s caregiver. 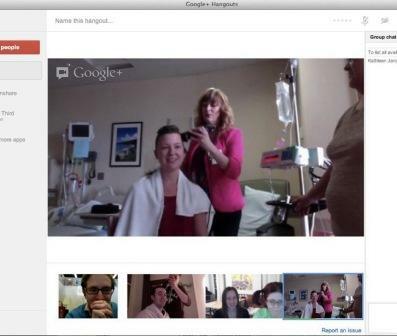 Via video chat, Miranda’s friends supportively watched as Julie and Miranda got their hair buzzed. Both Julie and Miranda are being incredibly positive and have expressed thanks to everyone who has been helping them through their journey. To learn more about Julie and Miranda, click here.